The new look all change Orient beat Maidstone United 2-0 at Brisbane Road to make it two home wins on the bounce in four days. Goals from David Mooney on the hour and Romuald Boco at the death put the O’s into fourth position in the National League but caution should be reserved for any thoughts of promotion at this embryonic stage of the league season. Maidstone to their credit came out and played some decent football and could have gone home with a share of the spoils and Orient have the linesman to thank for another three points in the bag as Maidstone had a goal ruled out in the 89th minute when Delano Sam-Yorke smashed into the net after Charlie Grainger’s excellent save denied Joe Pigott. It kept the O’s 1-0 up and they finished off the game soon after. It was the Stones who started off the brighter of the two teams and the visitors could easily have taken the lead early on when Delano Sam-Yorke stabbed the ball home from a couple of metres out, but he was adjudged to have fouled keeper Charlie Grainger. 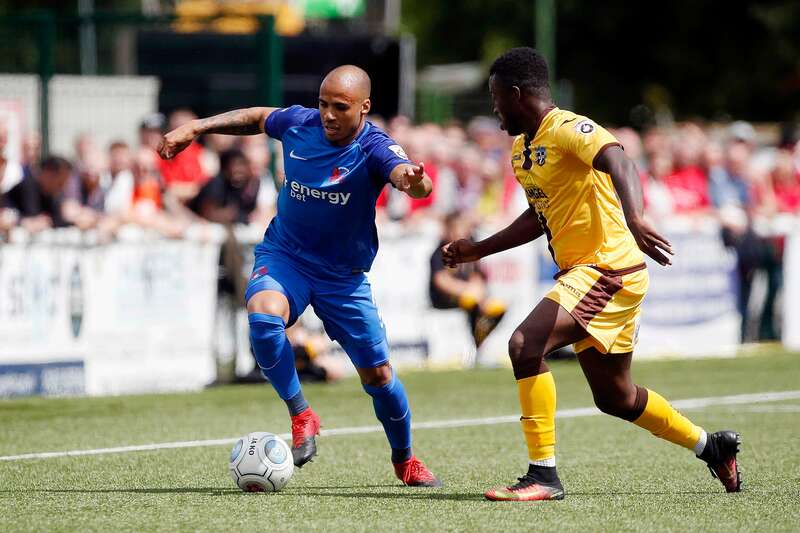 The Kent side’s Joe Pigott was then denied by the home keeper before Tom Wraight smashed over, as Maidstone continued to threaten and weren’t afraid to take the game to an initially nervous Leyton Orient team. After last Saturdays opening game and defeat of the season, Orient were bottom of the National League but following Orient’s much needed 3-1 win over Solihull at Brisbane Road in midweek, optimism for the home fans was to the fore as 5085 packed Brisbane Road. All hoped that the Solihull result was no flash in the pan and so it appeared not to be, as the O’s David Mooney opened the scoring for the hosts in the second half with a fine header from a great James Dayton’s cross. It was a good game with both teams not afraid to give it a go from the off and it was only in added time that the O’s doubled their lead when substitute Romuald Boco take from Charlie Lee’s pass allowed him to finish neatly under Lee Worgan the Maidstone keeper. Shortly afterwards the whistle blew and Status Quo’s Rocking All Over The World erupted from the loudspeakers as their were handshakes all around but more importantly those vital three points for the O’s. Davis kept an unchanged team for the third game on the trot, something that couldn’t even have been imagined last season and the team repaid him with a slick performance that bodes well for the rest of the season. The next match is another local derby as Leyton Orient head off to nearby Bromley this coming Tuesday with victory likely to put the O’s in the top three. The two wins in a short period of time will put smiles on the manager or rather new head coach Steve Davis and the club in general and shows what can be done in a relatively short period of time to transform the fortunes of Leyton Orient in little under 6 weeks. New owner, new chairman, new manager and a new team it was always going to be difficult and the transformation has been huge but let’s not count our chickens before they hatch, it’s going to be a tough season and probably consolidation would be the finer mistress. The €10,000 EmotiCoins Prize Draw!